Subhashita means good speech. 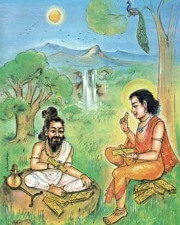 They are wise sayings, instructions and stories, composed in Sanskrit language. Subhasitas act as teacher in formulating the sense of morality and character, which sums up the total of a person’s virtues including dispositions, behaviors, habits, likes, dislikes, capacities, traits, ideals, ideas, values, feelings, and intuitions.